A little over a year ago Brother Dragomir, in Serbia, had the inspiration to use Facebook as a witnessing tool. Facebook is a social networking site of constantly growing proportions, reporting 500 million users as of July 2010. While it is often used to waste time, share personal information with people the users don’t know well, and many other worthless reasons, God has used it in this instance to defeat the Devil on his own grounds. Brother Dragomir, Brother Aladin, in Serbia, and Brother Jonatan Lerga, who is from Croatia, along with a few other believers created Facebook profiles and began to spread the Word. Within a year they have been very fruitful in witnessing and winning souls to Christ. Brother Jonatan has even seen some of the results in his home city! The brothers began by creating profiles exclusively for witnessing. They added as many Facebook friends as possible from various Facebook religious groups, and then shared Message quotes, Message links, videos and sermons with these friends. This initial contact was followed up with small personal letters explaining what they believe and offering free materials, such as Message books and DVD’s. Facebook has been very effective as a tool and has distinct advantages. Being on the World Wide Web, of course, Facebook has allowed the believers to reach far beyond their local, and even their national boundaries, and touch the lives of many, many people. Facebook also offers users an opportunity to classify their interests by joining “groups.” In Croatia and Serbia, both of which are 90% Catholic and Orthodox, it is difficult to find individuals or even small groups of people who are interested in studying God’s Word. On Facebook they readily identify themselves by joining groups such as: Pentecostals of Croatia, Those Waiting for the Coming of the Lord, and are much easier to contact. Individuals visiting the witness pages usually have time on their hands to be able to browse its content. They are usually alone, which is not the case if the brothers visit their church with the intention of witnessing. With no deacons or preachers there to suggest their ideas about Brother Branham and the Message, these people will have a chance to check the messages by themselves, and if they are interested in something they are usually more comfortable asking questions, or submitting their contact information for free materials online than they would be in a face to face conversation. Facebook cannot replace a live contact, but it is very useful in preparing the way for a legitimate contact to be made. With only a few believers putting forth an effort there has been a tremendous impact. Contact has been established with more than 5,000 persons worldwide, and 400 packages containing Church Age Books, Brother Branham’s Life Story, Deep Calleth To The Deep DVD’s and other messages have been sent to those wanting to know more. Considering that those 5,000 people contacted have likely cascaded the information they received to their friends, family and associates, the number is likely significantly larger. While a large number of their Facebook contacts are in Brother Dragomir, Brother Aladin and Brother Jonatan’s home country, this outreach has extended to Australia, Austria, Bosnia, the United States, Denmark, France, Indonesia, Kosovo, Macedonia, Germany, Slovenia, Serbia, Switzerland and Czech Republic. In Brother Jonatan Lerga’s home city there have been seven baptisms in the last four months, four of them being contacted initially by Facebook. Two of these testimonies are especially interesting because they were members of a local Pentecostal church where Brother Jonatan has gone many times in the past, trying to witness. He was never able to contact them before, but through Facebook, God found a way to touch His Seed and Viktor and Sasa came to the light of the Message. 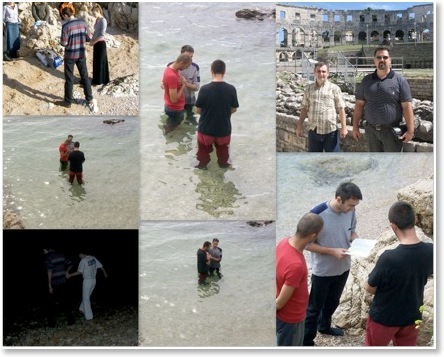 They in turn witnessed to two of their friends, Goran and Ana, who also accepted the Message and were baptized. Sanjin and Maja also learned of the Message by the Facebook outreach, and have been baptized, along with Monika who was witnessed to by the local believers. Brother Jonatan reports that many more are coming but have not yet been baptized, and the Gospel is still spreading!